OK, I saw the Fassbender film last year upon its release, and really liked it. And I matched it up with a Polish-language version I saw related to the Shakespeare’s Globe production in my GlobePlayer.tv app. I figured, what the heck, let’s see how this goes…after all, I had liked the Maori Troilus and Cressida I saw last year. Well, let’s just say this version is different. Modern dress, seemingly within the eastern European underworld. Witches as drag queens (or is that vice-versa? ), who play a much larger role in the play. Much use of modern music (from Michael Jackson, to 50 year-old Japanese pop standards, to “Bang Bang, My Baby Shot Me Down,” to “Mein Herr” from Cabaret…basically, music by Quentin Tarantino). Ross rapes Lady Macduff on stage–brutally–while Seyton masturbates in a corner. But is it any good, I hear you ask…well, yeah, it’s fascinating. To see the Macbeths as low-level thug and moll is an interesting take. 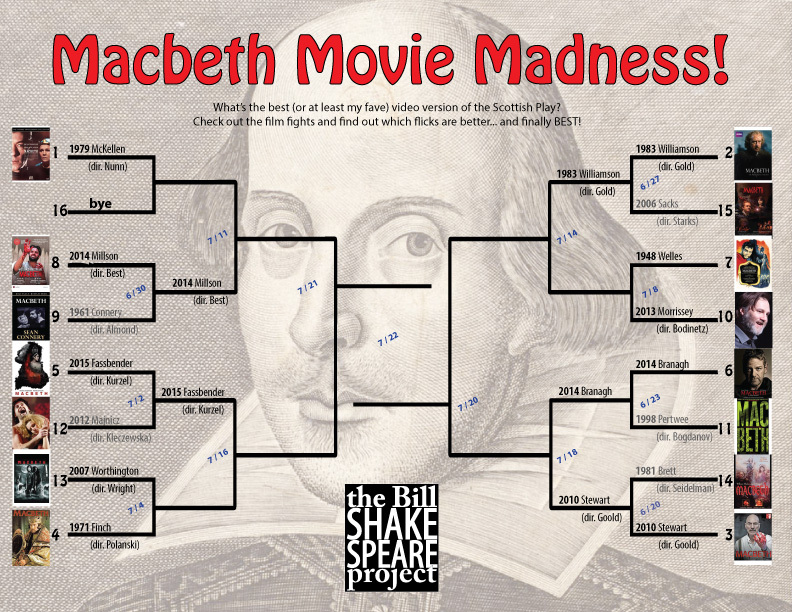 To see that Macbeth and Banquo are more rivals than friends from the start is a great twist, too. And some of the edits are interesting: turning the letter into an actual conversation leading to Lady M saying the “milk of human kindness” speech to Macbeth makes for some very good interplay. Not everything works, however, and if you’re any sort of stickler for textual continuity, this could be really hit-and-miss. But then so could the 2015 film. Here, too, we get the “human kindness” speech delivered to Macbeth. The addition of a dead child to the Macbeth household (as well as what seems to be a surrogate son to Macbeth on the battlefield…and in a nice nod to PTSD, the dagger Macbeth sees before him is being held out by that boy). We see the murder of Duncan, and the killing of the guards. Macbeth has the Macduffs burned at the freakin’ stake. And like the Polish production, Macbeth carries his wife’s dead body as he responds to news of her death. So, yeah, the script has been cut and rearranged quite dramatically. On a second viewing, however, I think it works even better than I did when I saw it over six months ago. Fassbender and Cotillard both give incredibly strong performances, and the film–as I mentioned then–is stunning to look at. It’s an easy call, this one. Fassbender and Kurzel move on to the second round, where they’ll do battle with the winner of our next match-up: Sam Worthington’s Scot from 2007 going up against the Polanski version from 1971.